Visiting Chinese President Xi Jinping and German Chancellor Angela Merkel on Wednesday watched a football match between Chinese and German youth teams, encouraging young players to foster friendship. 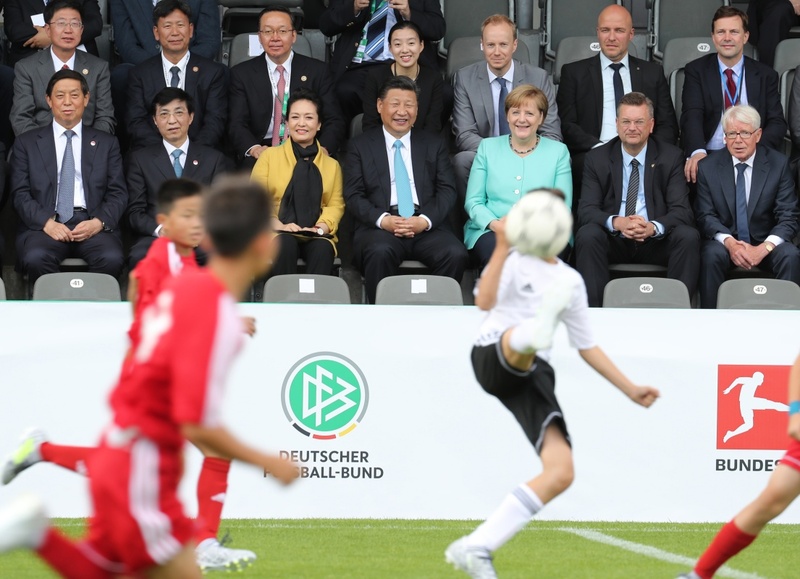 Chinese President Xi Jinping (center, front row) and German Chancellor Angela Merkel (thrid from right, front row) on Wednesday watched a football match between Chinese and German youth teams in Berlin, Germany. "You are the future of the Chinese and German football," Xi told the Chinese footballers and their German peers before the friendly match kicked off in Olympiastadion Berlin, a world-famous sports stadium. "I hope you can develop the hardworking spirit, learn from each other, and maintain close friendship," said Xi. Merkel welcomed the Chinese president and his wife, Peng Liyuan, before they met German football dignitaries on the field. The leaders also watched a photo exhibition on football cooperation between the two countries' schools. After the match, Xi pointed out that China and Germany are advancing football cooperation and that it is a systematic project to improve football skills. China is willing to push for all-round football cooperation with Germany, said Xi, adding that with joint efforts, the two countries will harvest more fruits from the cooperation. Xi arrived in Berlin Tuesday afternoon for a state visit to the European country, where he will also attend a G20 summit in the German port city of Hamburg.